It's amazing how many chances Port Huron gets to support a hockey team! This is franchise #6 since 2002! 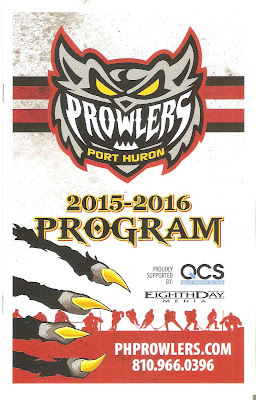 The Port Huron Prowlers are a Single-A level pro hockey club in the Federal Hockey League (FHL). 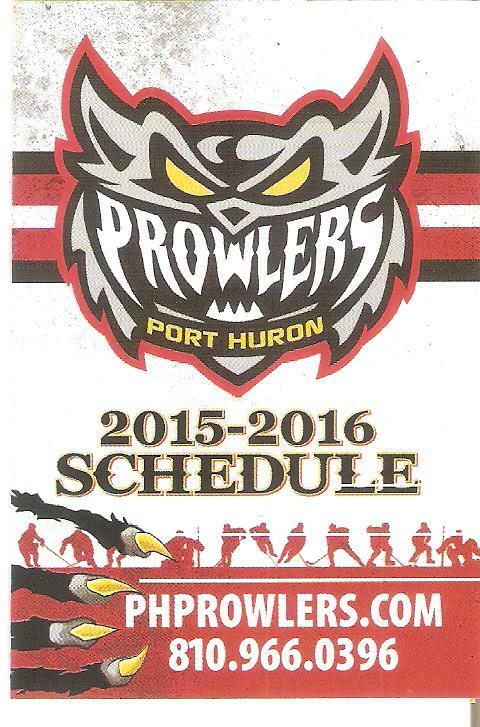 They are in their first season of operation, and the first pro hockey team in Port Huron since the 2010 Icehawks. The Prowlers are owned by Barry Soskin, who also owns the Danville Dashers, and play their home games at McMorran Arena. They are coached by former Beacon Trevor Karasiewicz. With the departure of the NAHL's Fighting Falcons, Port Huron went without hockey in 2014-15, the first time that happened in 19 years. The FHL, on the lookout for expansion sites, scheduled a neutral site game at McMorran between Danbury and Danville. When a crowd of over 1700 showed up, the league granted an expansion franchise to Soskin. Most of the front office (and quite a few players) from the now-defunct Dayton Demonz (who Soskin also owned) were shipped north to Port Huron to set up this new franchise. A name-the-team contest was held, and "Prowlers" was chosen as the winner. The team's uniforms are nearly identical to the Detroit Red Wings (and a tribute to the old Port Huron Flags), with the Prowlers logo emblazoned on the front and shoulders. Normally, at this point I would go through the statistics for the season, but since it's only two games old, there's no point. As for the program, I was surprised there was even one to begin with! With the Fighting Falcons, all you got was a roster sheet. The Icehawks had yearbooks, but they were kept in the Pro Shop. As for this one, it's not too big, but more than I expected. It's 23 pages, all color and on glossy paper. There are numerous local ads, such as Fuel Woodfire Grill (highly recommended, btw), Freighter's Eatery and Taproom and Flagship Community Federal Credit Union. There's a league map, bios on the front office and the coaching staff. There is also a team photo and a 2015-16 team roster page with color photos of each player. As for the game, Danville crushed the Prowlers, 6-0, in front of 1,053 fans (I thought there were more than that). It was a pretty sloppy game, lots of blown passes, missed hits, poor stickhandling and ugly goaltending. I wasn't expecting too much in terms of quality. Single-A level hockey can be pretty rough. It's definitely a step back from the Icehawks and Border Cats. But, it was nice to go to a hockey game at McMorran again. There seemed to be a buzz in the crowd that did not exist when the Fighting Falcons were in town. Plus, the Prowlers did a lot to keep the crowd entertained throughout the game and intermission. Again, Single-A hockey is what it is, but I enjoyed it and am glad Port Huron has a team again. I'll be back to another game. And BTW, I love this logo!